Oddly enough, i, too, like folk art. So that's how they tend to teach things around here. And really - how long could explanations possibly go on for all this, hm? Meanwhile, we're starting a new Vote Incentive today. It's something of an ongoing vote incentive for the duration of the blackboard tale. 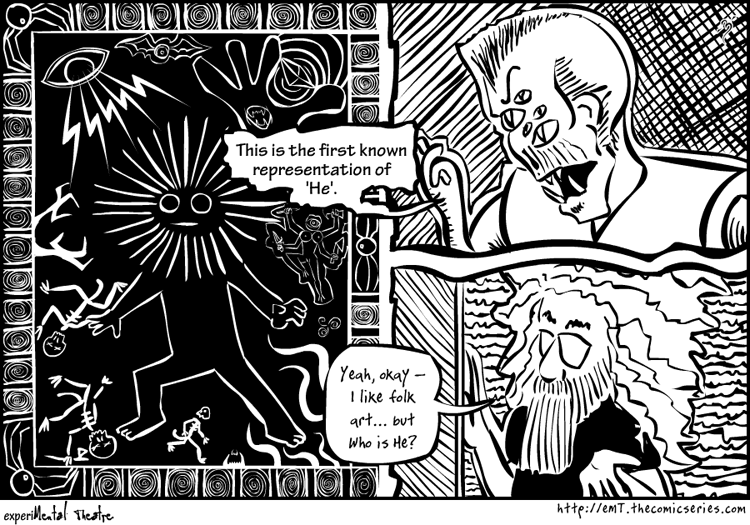 It's going to be necessary to have word balloons for the discussion obscuring parts of the folk art. Voting for eMT shows you a slightly larger version with no obstructions over the original drawings. This image will stay up until the next blackboard panel replaces it. Incentives will update the same day as the new strip appears, so if you want them, vote before it changes. Never know when you might want to be able to refer to those clues later. Or collect them all and do a landscape banner print of all of them and use is as a modern tribal art border to give your walls that extra zest you feel has been missing from the room! No - "Him" was created by a team of renegade scientists in The Fantastic Four and eventually became Adam Warlock. Nice! Reminds me of the aboriginal cave drawing of Australia.